During the Revolution, the church, and its congregation, aligned itself with the rebel or patriot cause. As a result, in November of 1782, Gen. George Washington visited the church. A hand-written letter by Washington regarding his reception at the church is proudly on display in the Narthex of the church. It is significant to note that during the entire eight years of the American Revolution, this was Washington’s only reference to a religious institution. Another notable personage from the Revolutionary period associated with Old Dutch Church is George Clinton. Clinton served as the first Governor of the State of New York and was the longest serving Governor of any US state. He was a General in both the Revolution and the War of 1812 and an Admiral in the New York State Navy. George Clinton served as Vice-President under two separate presidents, Thomas Jefferson and James Madison. He is the only man to hold this distinction. George Clinton died in office and was laid to rest in the Congressional Cemetery in Washington D.C. In 1908, he was re-interred in the Old Dutch Church Cemetery and the same monument from the Congressional Cemetery marks his grave and stands in his honor. The present structure was designed by renowned architect Minard LaFever and was completed in 1852. Constructed of massive cut, native bluestone, the imposing edifice is crowned with what was at one time the tallest steeple in New York State. By city ordinance, no structure in Uptown Kingston can be constructed taller than the steeple of Old Dutch Church. This has allowed for the unique historic character of Uptown Kingston to be preserved and our steeple stands a beacon which forms part of the skyline of the City of Kingston and can be seen, literally, for miles. The interior, designed by Minard LaFever, is in the style of Christopher Wren and is considered unique for this country. Utilizing the Christian symbolism of 3(the Trinity), 5(senses), and 7(days of creation), LaFever designed a Sanctuary that has been described as being “architecturally perfect.” At the head of the Sanctuary is a 15-foot illuminated stained glass window depicting thePresentation of Jesus in the Temple, created by Louis Comfort Tiffany and installed in 1891. Hundreds of first-time visitors to the church each year remark about the beauty and grandeur of the Sanctuary. Over the years, many ecumenical services have been held at Old Dutch Church to commemorate significant events. In 1901, the church held one of the official funeral services for President William McKinley after his assassination in Buffalo, New York. Within hours of the sinking of the Titanic on April 12, 1912, a memorial service for the victims of the disaster was held in our Sanctuary. And most recently, on the evening of September 11, 2001, Old Dutch Church was again the site of a community outpouring of shock and grief as we struggled to cope with the attacks on our country. In 1932, Franklin Delano Roosevelt, then Governor of the State of New York, addressed the church at the 150th commemorative service of the visit of General George Washington. Among the other more recent notable speakers who have presented at church functions are Congressman Hamilton Fish, Jr., Norman Vincent Peale, Brigadier General James E. Cartwright, USMC, Assistant to the Joint Chiefs of Staff, and historian Heywood Hale Broun. Old Dutch Church continues to make its mark on history. With Church records dating back to the Mid-1600’s, people from all over the United States visit the church to do genealogical research, from their personal genealogy to the history of the region and America. Frequently, organized tours arrive from distances by chartered bus and even by inland cruise ships. Additionally, the church has published several historical and genealogical books as well as having transferred extensive records to micro-film and digital archives. The church’s history is a popular cultural and educational resource to the community and researchers. This is accomplished through the Old Dutch Church Heritage Museum which is committed to preserving our archives of records and artifacts. 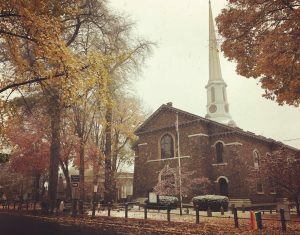 The church is the site of the Daughters of the American Revolution Memorial Day Ceremonies each year and is a focal point in the Annual George Clinton Recognition Day. It also takes part in special events such as the re-enactment of the Burning of Kingston and Dutch Colonial Church Services. The Old Dutch Church is not only interested in preserving and educating the public about its own history but frequently takes a pro-active role in protecting the secular history of the community as well. For example, when Kingston’s old City Hall became a virtually derelict building, church members removed the surviving bas-relief plaster lunettes depicting the city’s history to the basement of the church, thus preventing their total destruction. Now, with the financial help of Old Dutch Church as well as many others, the lunettes have been refurbished and returned to City Hall which was renovated in 2000. In 2008, Old Dutch Church was declared a National Historic Landmark by the Federal government and in 2009 we celebrated our 350th Anniversary! We are an active and open congregation with Sunday School and services weekly at 10:30am. We also have Choir, fellowship, arts series and mission & outreach to the local and global community. We hope to continue to serve for another 350 years! Learn more about our Mission here. Feel free to contact the Church office at 845-338- 6759 or info@olddutchchurch.org with any questions.